One wonderful example of a found object artisan is Chrystal Nausse who is based in New Orleans. 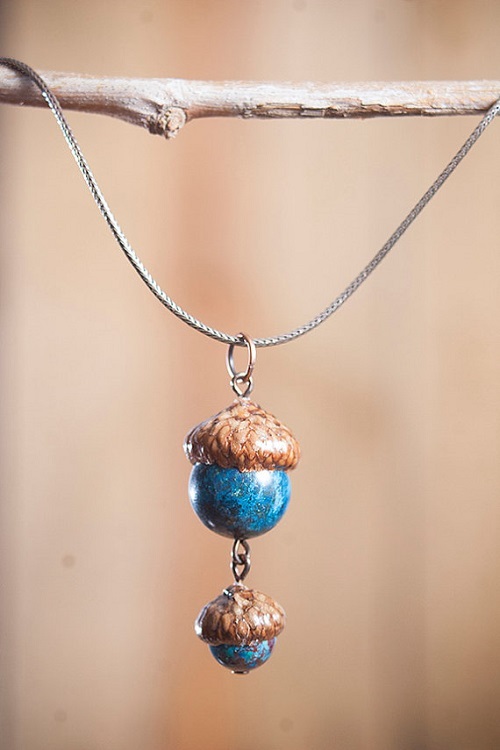 She makes real acorn jewelry out of the acorn cupules or caps she finds. Her shop name is unforgettable - Nuttier than a Squirrel. 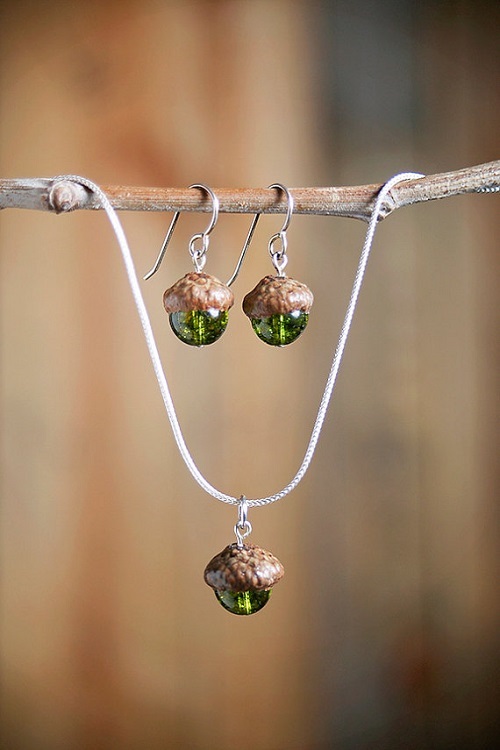 What I like about her minimalist style is how she teams up the acorn caps with many different kinds of gemstones. These gemstones add color to her designs. It's not just a matter of collecting the acorns. What she does is to clean them, roast them to get the right color and then seal them with a protective coat. She initially made some for just her mother and sisters. She went on to sell a few more pairs of earrings to others. But the route to her Etsy store was a slow one. 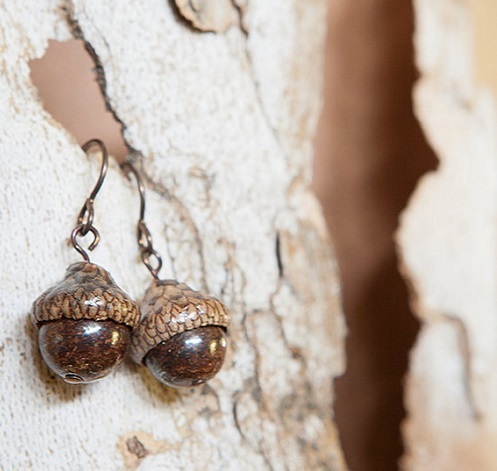 Chrystal explained why : " I have a formal art degree (and now a Master’s in Anthropology, but we won’t talk about that), so I was a little reluctant to start making “crafty earrings”. But folks thought that they were the cutest things EVER…and kept insisting that I carry a line of my jewelry in their shops. So I gave in slowly…"
Chrystal's sense of humor came across so well when she also explained how she came up with her shop name. She said, "Let's face it. I'm anxious. If I had a totem animal, it would be a squirrel. This is not by choice, because I am pretty sure that they are the hairy version of rats." "I collect, create, photograph, and market everything all by myself. I guess I’m a bit of a Renaissance woman. Or a busy little squirrel. And I drink lots, and lots of coffee." 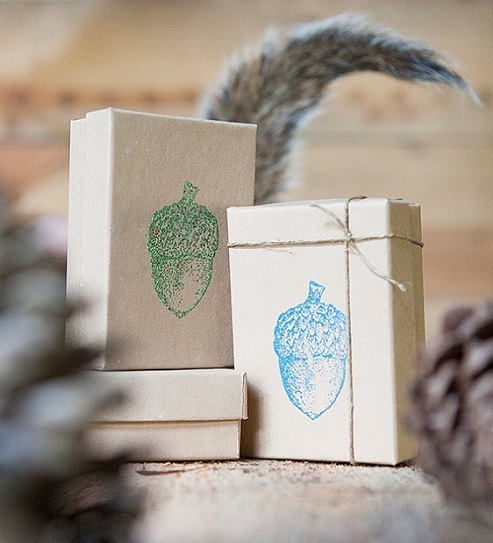 Her packaging design photo with stamped acorns, pinecones and that squirrel like tail is spot on! Oh my goodness!! I LOVE this woman!! Love her sense of humour in particular and LOVE her style!! I'm struck by how she's taken something that lays all over the ground there and made such beautiful jewelry out of it!! Who cares that she's whip-smart to boot?!! Just adds to the whole package! Btw - Hairy rats just cracked me up!! Love these very very much!! THANKS for featuring her Pearl!! She has such a wonderful sense of humor, hasn't she! Yes, she is lucky with easy access to lots of oak trees. Beautiful and whimsical! Good she's found a way to prevent the acorns from cracking! She has spent the time experimenting, I am sure!! Awww! Shucks, y'all! Thanks for all the warm feedback. I love creating these little keepsakes so much. It's wonderful knowing that folks get to keep that good New Orleans mojo with them no matter where they are.